On particularly hard days when I feel that I can’t endure, I remind myself that my track record for getting through hard days is 100% so far. So many of us are afraid of ourselves, of our own truth, and our feelings most of all. We talk about how great the concepts of life and love and passion are, but then we subconsciously hide from them every day. We hide from our truest feelings. Because the truth is, life and love and passion all hurt sometimes, and the feelings this pain brings disturbs us. We are taught at an early age that pain is evil and harmful. Yet, how can we ever deal with real life and true love and passionate work if we’re afraid to feel what we really feel? We need to feel pain, just as we need to feel alive and loved and driven. Pain is meant to wake us up, yet we try to hide from it. Realize this! Pain is something to carry willingly, just like good sense. Because you can only learn how strong you are in every important area of your life when being strong is the only choice you have. It’s all in how you carry the things that don’t come easy or don’t go your way. That’s what matters in the end. You should stand up for your right to feel pain, to endure it, to deal with the hard realities of life and love and work, as you grow into the strongest, wisest, truest version of yourself. While I’m certain there’s no “one size fits all” list of advice for growing through the pain of hard days, there are some very important general principles that apply to most people who are presently in the trenches. The points below, then, aren’t universal clarifications, but simple guidelines that will hopefully give you a general starting point for supporting yourself when you need it most. 1. You need to start shifting your focus. Those are the opening lines of a story an attendee at our Think Better, Live Better conference shared with me (her commentary was recorded live and I’m sharing this with her full permission). She went on to tell me that expecting negative things to happen has been her way of approaching life. If you can relate in any way at all, it’s time to revamp your mindset. Our minds are incredibly powerful. They can bring us down or lift us up at a moment’s notice. How we think about things literally changes everything! Whenever I’m coaching someone who’s struggling in the trenches, I gracefully shift their focus from what they don’t want to what they DO want. I remind them that what you focus on grows stronger in your life, and that the best time to focus on the positive and take responsibility for your happiness is when you don’t feel like it. Because that’s when doing so can make the biggest difference. You may not be responsible for everything that happened to you in the past, or everything that’s happening to you right now, but you need to be responsible for undoing the thinking patterns these circumstances create. It’s about thinking better so you can ultimately live better. The key is to understand that no matter what happens, you can choose your response, which dictates pretty much everything that happens next. Truly, the greatest weapon you have against anxiety, negativity and stress is your ability to choose one present thought over another—to train your mind to make the best of what you’ve got in front of you, even when it’s far less than you expected. 2. You need to start questioning the stories you’re telling yourself. In a very real way, the stories we tell ourselves change what we see in life. When we enter an experience with a story about how life is, that tends to be what we see, even when there’s plenty of evidence to the contrary. I was reminded of this recently by another attendee at our Think Better, Live Better conference. She compared her present marital problems and stress to an old parable in which a group of blind men touch an elephant for the very first time to learn what it’s like. Each one of them feels a different part of the elephant, but only that one part, such as the leg, trunk, side, or tusk. Then the men eagerly compare notes and quickly learn that they are in complete disagreement about what an elephant looks like—and lots of tension and drama ensued. Something similar happens through our wide-ranging, different past experiences. Some of us have been deeply heartbroken. Some of us have lost our parents, siblings or children to accidents and illnesses. Some of us have dealt with infidelity. Some of us have been fired from jobs we relied on. Some of us have been discriminated against because of our gender or race. And, when we enter a new experience that arouses prominent memories of our own painful story from the past, it shifts our perspective in the present—it narrows it. When a negative past experience narrows our present perspective, it’s mostly just a defense mechanism. Every day of our lives we are presented with some level of uncertainty, and our innate human defense mechanisms don’t like this one bit. So our minds try to compensate by filling in the gaps of information by clinging to the stories we already feel comfortable with. We end up subconsciously trying to make better sense of everything in the present by using old stories and past experiences as filler. And while this approach works sometimes, other times our old stories and past experiences are completely irrelevant to the present moment, so they end up hurting us and those we love far more than they help. What is the story I’m telling myself right now? Can I be absolutely certain this story is accurate? How do I feel and behave when I tell myself this story? What else would I see and experience if I removed the story from my mind? Do your best to consciously detach yourself from the story you’re telling yourself. Go deeper into reality. Don’t just look at the surface. Investigate. Observe without presupposing. Again, it’s about thinking better right now so you can ultimately live better right now. 3. You need to start watching your (very human) tendency to fabricate negative meanings and conclusions. Replacing your negativity with positivity isn’t about turning off all your negative thoughts and stories; that’s nearly impossible because negative thinking typically arises spontaneously and uncontrollably. It’s also not about turning your false negative thoughts and stories into false positive ones. The goal is to reframe your negative thoughts and stories effectively, so they are based entirely in reality, detached from needless drama, and focused on the next positive step forward that can be taken in the present moment. “He was late, so he must not care about me.” – Or, perhaps he just got caught in traffic. “If I can’t do this correctly, then I must not be smart enough.” – Or, perhaps you just need a little more practice, just like the rest of us. “I haven’t heard back from the doctor, so the test results must be bad.” – Or, perhaps the lab is just really busy and your results aren’t available yet. Fabricating negative meanings and conclusions like these, based on your own stubborn expectations, is a great way to keep your mind stuck in the gutter. This isn’t to say that you should never expect anything at all from yourself and others (diligence, honesty, ambition, etc. ), but rather that the thought patterns governing your expectations should not automatically steer you toward unreasonable negativity. Remember, negative thinking stops us from seeing and experiencing life’s positive and neutral outcomes, even when they happen often. It’s as if there’s a special mental block filtering out everything except the data that confirms the negative biases we have. So, do your best to catch yourself today. Being able to distinguish between the negativity you imagine and what is actually happening in your life right now is an important step towards living a happier life. 4. You need to start letting go of what can’t be changed. One of the most important moments in life is the moment you finally find the courage and determination to let go of what can’t be changed. Because, when you are no longer able to change a situation, you are challenged to change yourself… to grow beyond the unchangeable. And that changes everything. Of course, when hard times hit there’s a default human tendency to hold on—to extrapolate and assume the future holds more of the same. This doesn’t happen as often when things are going well. A laugh, a smile, and a warm fuzzy feeling are fleeting and we know it. We take the good times at face value in the moment for all they’re worth and then we let them go. But when we’re depressed, struggling, or fearful, it’s easy to heap on more pain by assuming tomorrow will be exactly like today. This is a cyclical, self-fulfilling prophecy. Know this! If you don’t allow yourself to move past what happened, what was said, what was felt, you will look at your present and future through that same dirty lens, and nothing will be able to focus your foggy judgment. You will keep on justifying, reliving, and fueling a perception that is worn out and false. But be sure, this is more than simply accepting that life will improve as time passes. Yes, “time heals wounds,” but yours is not a passive role in the process of healing and moving past pain. The question is: where are your present steps taking you? It doesn’t matter what’s been done; what truly matters is what YOU DO from here. Realize that most people make themselves miserable simply by finding it impossible to accept life just as it is presenting itself right now. Don’t be one of them! Let go of your fantasies. This letting go doesn’t mean you don’t care about something or someone anymore. It’s just realizing that the only thing you really have control over is yourself, in this moment. 5. You need to start being consistent with the right daily rituals. How many daily workouts have you missed because your mind, not your body, told you that you were too tired? How many daily workout reps have you skipped because your mind, not your body, said, “Nine reps is enough. Don’t worry about the tenth”? To this day, the answer to both questions is surely hundreds for most people, including myself. Weakness of the mind is a real dream killer, especially when the going gets tough, and the only way to fix this weakness is daily practice. Far too often we think that inner strength is all about how we respond to extremely hard circumstances. How did she perform on stage during that nationally televised event? Did he bounce back from that heart-wrenching divorce? Can she keep her life together even after suffering from a major, debilitating bodily injury? There’s no doubt that extremely hard circumstances test our bravery, determination and inner strength, but what about common, daily circumstances? Just like every muscle in the body, the mind needs to be exercised to gain strength. It needs to be worked consistently to grow and develop over time. If you haven’t pushed yourself in hundreds of little ways over time, of course you’ll crumble on that one day that things get really challenging. Choose to go to the gym when it would be easier to sleep in. Choose to do the tenth rep when it would be easier to quit at nine. Choose to create something special when it would be easier to consume something mediocre. Choose to raise your hand and ask that extra question when it would be easier to stay silent. Prove to yourself, in dozens of little ways, that you have the guts to get in the ring and wrestle with life on a daily basis. Inner strength is built through lots of small, daily victories. It’s the individual choices we make day-to-day that build our “inner strength muscles.” We all want this kind of strength, but we can’t simply think our way to it. If you want it, you have to do something about it ritualistically. It’s your positive daily rituals that prove your mental fortitude and move you in the direction of your dreams over the long-term. Which point discussed above resonates with you the most today? Your point on rituals is so incredibly on point for me right now. 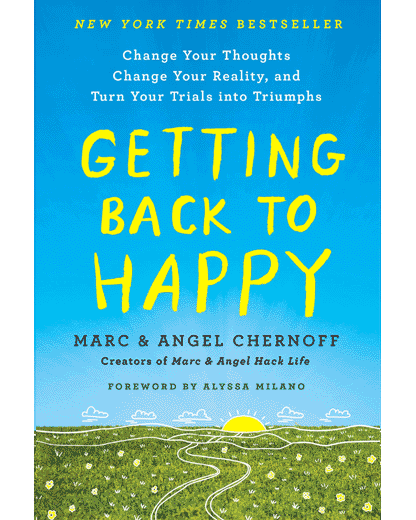 I’m actually a new student in your getting back to happiness course right now and I have a coaching session scheduled with you for next week. Marc sent me a couple emails already, checking in on me and holding me accountable to some personal daily intentions I have set for myself. With the progress I’m already seeing, there is no doubt in my mind that daily consistency is more important than any other strategy for making progress in life and love. Anyway, I just wanted to jump in here and say thank you for this article and especially #5. Cheers to doing the hard things for yourself! PS. Just pre-ordered your new book! Can’t wait to dive in and share it with my daughter. Great Article. So often I make excuses for the lack of consistency with my ‘right’ daily rituals or stop at the 59 th pushup…..come to think of it, one less than every physical repetition goal. Perhaps that is an indicator of my consistent failure with success for points 1 to 4. From today will strive for ritual consistency and re-visit this article weekly. You’re doing great, Megan. Consistent progress! It’s inspiring to see is transpire. And thank you so much for supporting our new book, too. Another email/article of yours arrives in my inbox…right on time! Thank you. I most deeply resonate with the opening lines this time around. Honestly, this whole article is wonderful, but I had a really tough few days in a row and above all I needed the reminder that my track record for getting through has been 100 percent so far. Thanks again! Excellent points! Your second point deeply connects with some of my present stress and anxiety. There are some stories I know all too well, that aren’t necessarily false, but are very old, that I have been attaching to for far too long. I know I need to make some shifts about who I know myself to be as a person, but it’s tough. Like you said, it’s a “hard thing” I need to start working on for myself. Thanks for the guidance. Just ordered your new book. Point #4 resonated deeply with me. “You need to start letting go of what can’t be changed.” I lost my husband to ALS (which was an awful journey) 2 1/2 years ago. A year ago I was diagnosed with Parkinson’s disease. I have been grieving the triple loss: my husband, myself (Parkinson’s and grief have changed me from a self-confident, motivated, vibrant person to an anxious, depressed shadow of my former self) and the future I had envisioned for us. You are so right: I need to let go of what can’t be changed and find a new way…. All excellent …points… EXCELLENT !! I put a little hand-lettered chalkboard sign in my garden, right on the gate I walk through each day, that says “Happiness is a choice.” I love seeing it because it also helps me celebrate the fact that I am learning to be my own best champion, I am letting go of things I cannot control, and I am living in the moment. Your material is fantastic! I am so grateful to have stumbled across Marc and Angel on Twitter! Thank you!!! Fantastic write up! Absolutely every single party of it resonates with me at this time. I’m constantly struggling with my own issues that I thought I’d let go of a few years ago, however they’re back haunting me again! I am aware that I cannot control the situation, however it hurts me deeply and or is this that I find difficult to manage. I’ve an appointment with a CPN this week. Today in the morning a past event that ended up sour kept me feeling lazy for the day and spent a lot of time having these negative thoughts about the future. I remembered a while back when I used to hit the gym regularly to clear my head, did workout in the house and boom my day has been fruitful. Fixed myself a healthy lunch meal and cleared my mail inbox. Daily rituals keep me going. Like many others, I feel your emails arrive at precisely the right time. Amazing synchronization! This one was especially meaningful as I’ve been teaching my kids that in life it’s what you do… not what you say you’re going to do, that makes you who you are. The examples of rituals and the extra workout; the extra rep highlight that exact point. Thank you for being a voice of calm, reason and hope in this murky world we’re in. You are very much appreciated! This makes me think of my 3.5 year estrangement with my Mother and Stepfather; He is very much clinging to old stories, so far as to pull out one from 30 years ago, which stunned me. I think this is because I am not in their lives, there are no new interactions to find fault with, so he goes back to when I was 19 years old and was struggling on my own. I am trying to get to a place of feeling compassion/sorry for him for living so negatively and it sad how he is invested in fueling the estrangement. So your point #4, Let go of the things you cannot change speaks to me too. I am done trying to respond to his family drama. I am letting it go by not engaging them in toxic conversations, holiday visits, etc. And it feels like a huge relief! Thanks for bolstering my resolve today! Your emails are a ritual for me every morning as one of the first things I do as I drink my coffee and prepare for the day. They really help me focus my thoughts. Have a great day! I can’t wait for your book. Thanks, Angel, for your encouragement to do the hard things. The second point resonated most with me. I took up your challenge & aim to continue to ask these questions regularly! Thank you for your blogs which is helping me get through a hard time right now with so much concern fear and worry in the moment and for good reason. I know I have to really work hard and be determined and most importantly as you point out numerous times (thank goodness) is be do what you need to now to get to tomorrow otherwise myself and others would be too overwhelmed about how the future will be and try but not ever really succeed. Thank you for this excellent article. The real world is not always roses & sunshine. It is too easy to get caught up in an unhealthy environment. I didnt realize that is where I have been stuck. I see that it has impacted not only me but others in my life. Thank you for the encouragement to open my mindset & pull myself out from the negativity for my well being. Marc and Angel, you are really a mentor every single word of you mail to me is always coming with power and inspiration, may God continue to empower you more and more. Hello Marc & Angel, Thank you for your emails full of encouragement that you’ve been sending me, they are full of good ideas I’ve been benefiting from. I want to become a student in your program, however, I am lacking the resources at present. I suffer from a terrible self esteem due to a life full of poverty, misery, traumas and lack opportunity. I am in my sixty’s, and the older I get the more I hate myself. Would appreciate your comments. This article is extremely timely. The point that resonated most with me was if you can’t change a situation, you’re challenged to change yourself. Wow! I’ve never heard the concept framed that way. Thanks for your insight and inspiration. Like others who comment on your helpful posts, the timing is uncanny. I woke this morning after a bad night’s sleep struggling with issues of stress and anxiety over a personal relationship. I opened my emails and the second to appear was this article! It was as though it was written for me personally and has given me confidence the steps I must take in my recovery process. I have made a few posters of your quotes and put them on the wall so I can see them from my bed. I was a great fan of the late Susan Jeffers and you guys similarly inspire me on my life journey. Did I ever need to hear this!!!!! The timing is perfect. It has made me cry….. Thank you! Loving to read your words… keep writing. Thank you so much for sharing this post – just what I needed to see as I’m in a hard period of my life. Thanks again. Oh my word!this came at the right time all the points you clarified were of great help to me.. I do find that when going through difficult times a ritual is critical. I also try to include in my ritual to increase my help to others whether it’s to call someone else who is also going through a tough time to volunteering to donating blood. Looking forward to your weekly updates. Letting go of things you can’t change…My favorite Life Lesson. If I get a chance: I would suggest that this article should be re-titled: “5 things to do now and always, to keep hard days in check”. I have my own little check list of things to do but I focus on helping others and maintaining good friendships through easy and tough times as a hedge against pity parties and just breaking down and being stuck accomplishing nothing.. I was recently diagnosed with a severe illness and asked to put together my bucket list and end of life advanced directive. To most people that would have been a horrible way of saying your are going to die soon, so get yourself together. To me it just had me reach in my back pocket to get my life affirmations and goals. I am, what all of my friends and acquaintances, say is an anomaly. I don’t fit the usual man on the street that you might meet. But I did have to take a step back and look at things that your article points out more clearly, (and in a way that I hadn’t considered before). Means setting priorities on what is important. Too often we are grabbing for our cell phones to see what important junk email we have received and catching up on what drivel comes out of the mind of many of our Facebook friends.. (BTW, I don’t do Facebook). I have been re-prioritizing my electronic life along with the rest of my life. This includes who I associate with and how I deal with negative people around me. Since I am fairly positive I see negativity as a drain of energy that I have little of nowadays. 2) Stories you tell yourself. Both the stories you make up around how you deal with adversity and even daily life. The universe listens to those inner thoughts you tell yourself and the phrases you use to verbalize those thoughts. For example ever think to yourself or vocalize how much someone is a pain in a certain part of the body? Well my disease includes 3 broken bones in that part of my anatomy. This hits me closer to home than most. I have had to reprogram myself to think and say this person or act is painful rather than a pain in a place on my anatomy. It is really uplifting to point back to the source rather than to yourself, when it is THEY that are the source of the discomfort and time/energy drain. I could relate about 1 million conclusions that I could have jumped to after my diagnosis. Easiest ones were certain and definite death. Those thoughts didn’t really enter into my thinking process. I am a fighter for those things that are important to me and to my loved ones. I will survive the diagnosis and I plan to outlive the doctors that sent it my way. Positive thinking got me this far and will carry me through. This does not mean that I don’t look at other possibilities. It means that I plan for most positive outcomes and include end of life planning. Most people don’t get there. I take very little in this life as a personal attack on me. It helps when you are dealing with a life threatening illness that will shorten your life. It does not help when you are too close to situations that seem to revolve around emotions. But determining that there are things that you cannot change and working to change those that you can is very helpful as you go through life and all that it brings. 5) Rituals to strengthen your life. All of the methods of dealing with life’s little bumps are no match for the proper perspective and coping mechanisms. It is very hard to go through life without letting go of parts of yourself. Many times without wanting to do so. But setting up habits and mechanisms to deal with possible outcomes helps you to remain strong under adversity and work through those times when even a good cry isn’t enough. My motto: Live like today is your last day, Love like you have much to give. Share what you have with the least among us, and laugh as much as it is humanly possible. This is so “inspiring”…..thank you for “all of it”! And I would say to you both, “that’s good stuff.” Thank you. I could go one, but you get the idea. Very timely as well. I just lost my little cavalier last night. I have truly been devastated. I do need to focus on her little cavalier sister, as when pets loose a companion they also grieve. You have no control over dying. I feel I have had my share this year, of people and pets leaving my life. But your notes have given me some strength, so……one foot in front of the other. I suffer from anxiety and all it’s effects, physically and mentally; and negative thoughts are one of them. I try to live my life the best i can and i’m aware of all of this yet i can’t help it when i’m feeling stressed from something that has happened to me then the negative thoughts starts kicking in out of nowhere, i always try to block them out of my mind but it’s not easy. So i try to keep things that stress me out away from me and my daily life routine, find and be surrounded by things that i like and i feel comfortable with (that has helped me i think). But yeah, life is life and many things will definitely not go your way many times specially if you are financially unstable. This article speaks the truth and i will definitely consider following these advises. Thank you. Wow, just what I needed. Going through difficult time. On a daily basis I have to monitor my thoughts. Focus on what I want! Why is it so easy to think about worst case scenarios? #1. I’m working on diligently! #2. Big challenge may need help here. #3. & #4. Learned and apply some years ago. Working for me! #5. Yes! Daily rituals like going to the gym, meditations, inspirational reading, music, walks in park all keep me grounded and optimistic during this time. Thanks so much, it helped to reinforce my efforts. I’m sharing with friend. This really resonated with me simply because I have faced a whole new set of struggles (paying on student loans, kids dental bills, personal medical bills, car situation, living situation, etc) as soon as 2018 started up until now; which has been leading me to think that the cycle will continue and more bad things will happen. I realized; that this perception is as dangerous as it is false. This article helped me open my eyes to the fact that I need to let what is, just be; and work on the daily rituals to keep myself on track with goals and using this difficult time to strengthen my character, wisdom and ability to achieve my goals despite my setbacks. So thank you! Great article and it all aligns with what I’ve learned in my study of the Bible.Thank you! I read it few times and took many notes. I have been on desert of my life for now one year! Nothing seems to be going in the right direction. I know all the right thing to do but chains of hanging on to good things of the past has not allowed me to move one inch forward. All the right thing is in the head but not a single ounce of energy and motivation to do it. Will try again. I wish I could just take the first step! !